HISTORY was made in the early hours of May 8 when No. 399202 became the first tram-train to travel over Network Rail metals. 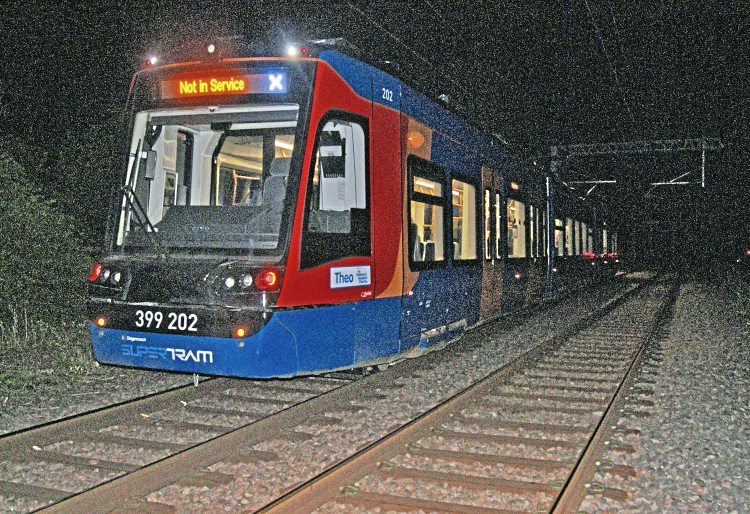 The move was part of initial gauging trials and took place between the Sheffield Supertram depot at Nunnery and the Magna Science Park on the outskirts of Rotherham. No. 399202 ran under its own power at low speed via the Tinsley Chord, which connects the Supertram and Network Rail lines. A further run took place early on May 10 and then a day later the same set was used in coupling trials with DB Cargo’s No. 66156 to test recovery procedures in case of failures on the Network Rail section. Commissioning and testing will continue over the next few months ahead of the start of passenger services to Rotherham Parkway, which is planned for September if all goes well. No. 399202 was also the first tram-train to enter passenger service on the Supertram network in September 2017.